Click here for suggested readings. Click here for a sampling of on-line resources that document Christian responses to the conflict in the Middle East. 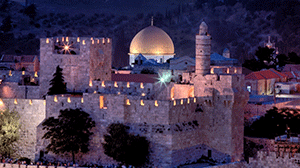 With the approach of Jerusalem Sunday this weekend, the Anglican Church of Canada’s national office has released new liturgical resources, including reflections from a pilgrimage by Ottawa-area women to the Holy Land last year. 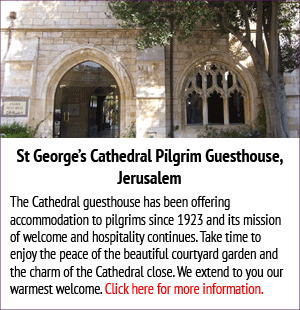 The Anglican Archbishop in Jerusalem, Suheil Dawani, has spoken of his “delight” at news that a mine clearance charity has secured permission to de-mine the area around the West Bank of the River Jordan on the approach to the traditional site of Jesus’ baptism. 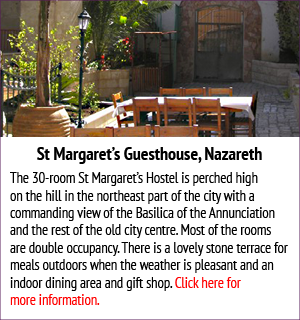 As the Anglican Church of Canada prepares to observe its second annual Jerusalem Sunday, as a day set aside to learn about and build support for the ministries of the Episcopal Diocese of Jerusalem, Archbishop Fred Hiltz and global relations director Andrea Mann are preparing for a journey to Israel, Palestine and Jordan. Andrea Mann, global relations director at the Anglican Church of Canada, took some time during her presentation to Council of General Synod (CoGS) Nov. 15 to talk about how Jerusalem Sunday has furthered the Canadian church’s commitment to building a strong relationship with the Episcopal Diocese of Jerusalem. Christian Zionism is a theologically-based belief about how the world will end that would likely be dismissed as a strange doctrine few Anglicans would be concerned about—if it didn’t affect Canadian and U.S. foreign policy in the Middle East. The land between the Jordan River and the eastern shores of the Mediterranean Sea, which both Palestinians and Israelis claim, has been settled, resettled, conquered and reconquered throughout history, as far back as biblical times. When Prime Minister Stephen Harper made an official visit to Israel this past January, media and other observers noted that his entourage included a strong representation of rabbis and conservative evangelical Christians whose churches espouse strongly pro-Israel views. At least one good thing came out of the terrible violence of the Second Intifada, the uprising against Israeli occupation sparked the founding of Kids4Peace, an international program that unites Muslim, Jewish and Christian youth in study and play. The Anglican Church of Canada and the Episcopal Diocese of Jerusalem have been companions in mission for many years, yet not much is known about this relationship. Each year, numerous Canadians visit the Holy Land as pilgrims, students and tourists, yet many know little of the life and witness of Christians there—be they Palestinian, Arab Israeli, Jordanian, Lebanese or Syrian. There is much to see, hear, experience and learn about being Anglican, being Christian in this ancient, troubled place today. Journey to Jerusalem Sunday—a multimedia web page produced by the Anglican Journal and Anglican Video—intends to make the people and stories of Anglicans in the Holy Land come alive in word, image and sound. We hope it will contribute to a greater understanding of how the ancestors of the first indigenous Christian community—“the living stones”—are living out their faith despite continuing social, political and economic hardships.